TCM is celebrating Cary Grant's 113th birthday on Wednesday with a lineup of seven of his movies. This week, TCM is airing great movies from stars like Errol Flynn, Cary Grant, and Dana Andrews. Plus, they are showing movies the Saint movies and featuring a night of Pink Panther comedies. So, without further ado, let's jump right in to this week's offerings. Just a note: All times are Eastern Standard Time and the highlighted texts have links to full length articles. Birthday tributes: Cary Grant on Wednesday; Patricia Neal on Friday. Sunday Prime Time: Two Pink Panther movies starring Peter Sellers as the bumbling Inspector Clouseau. Silent Sunday Nights: Captain Salvation (1927) at midnight is a hard to find silent film about a young seminary student (Lars Hanson), who risks his reputation to help a prostitute (Pauline Starke) in a small New England town. TCM Imports: Japanese director Akira Kurosawa's drama Red Beard (1965) at 2 a.m. Sunday night/Monday morning follows a doctor (Toshiro Mifune) and his young trainee (Yuzo Kayama) as they treat the ailments of the residents of 19th century Tokyo. Best Day to DVR: All day Wednesday. 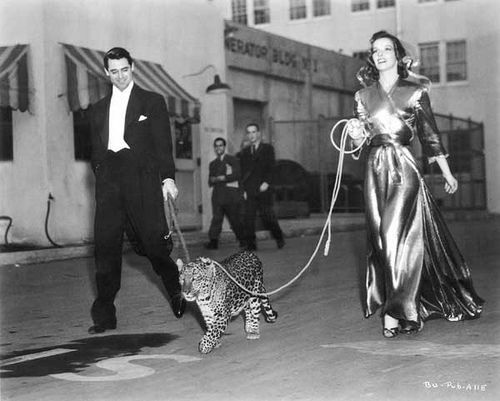 The daytime lineup is a tribute to Cary Grant that includes a great screwball comedy (Bringing Up Baby) and two of his Academy Award-nominated roles (Penny Serenade and None But the Lonely Heart). Prime time and late night offer three great musicals: the MGM classics It's Always Fair Weather (1955) and Meet Me in St. Louis (1944) and the French film, The Umbrellas of Cherbourg (1964). 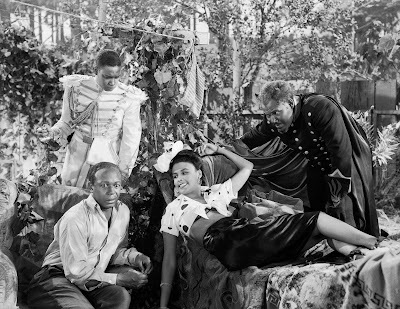 Eddie Anderon (seated), Kenneth Spencer, Lena Horne, and Rex Ingram in Cabin in the Sky (1943). Three daytime picks: TCM is celebrating Martin Luther King, Jr., Day with a lineup of movies starring African-American actors starting with Paul Winfield and Cicely Tyson in Sounder (1972) at 7:30 a.m. which is a wonderful portrait of the life of a struggling sharecropper family in the American South. Legendary baseball player Jackie Robinson plays himself in the biopic, The Jackie Robinson Story (1950) at 11 a.m., about his struggles to break baseball's color barrier. 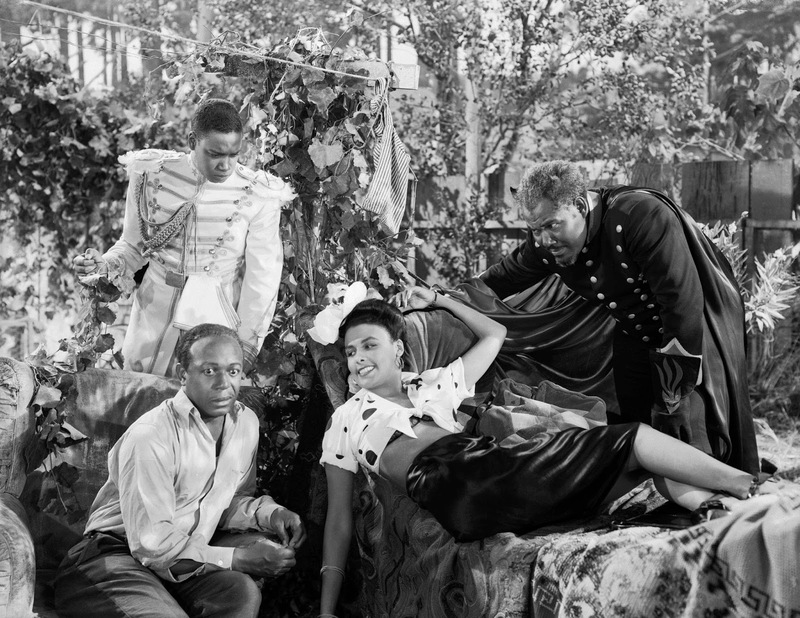 The musical, Cabin in the Sky (1943) at 4:30 p.m., features legendary performers like Ethel Waters and Lena Horne. Prime time lineup: TCM turns its attention to Civil Rights documentaries in prime time starting with You Got to Move (1985) at 8 p.m., which is about the efforts of ordinary citizens to end segregation in the South followed by Freedom on My Mind (1994) at 10 p.m., which uses interviews and archival footage to tell the story of voter registration drives in sixties Mississippi. Late night pick: Crisis: Behind a Presidential Commitment (1963) at midnight looks at President John F. Kennedy's attempts to desegregate the University of Alabama. 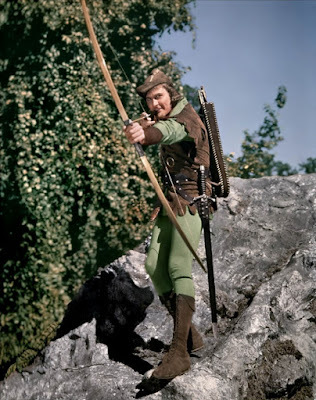 Three daytime picks: The theme is swashbuckling movies starring Errol Flynn, starting with his first movie with frequent co-star Olivia de Havilland, Captain Blood (1935) at 8 a.m. Flynn also buckles a fine swash in the Mark Twain adaptation, The Prince and the Pauper (1937) at 1:45 p.m. and in the all-time classic The Adventures of Robin Hood (1938) at 3:45 p.m.
Prime time lineup: TCM is featuring films about prison each Tuesday in January. This week's lineup features two musicals starting with Elvis Presley swiveling his hips to the Jailhouse Rock (1957) at 8 p.m. Next, Richard Barthelmess plays a falsely imprisoned man who finds comfort through music in Weary River (1929) at 9:45 p.m.
Late night pick: Laurel and Hardy try to bust out of the big house in Pardon Us (1931) at 4 a.m.
Cary Grant and Katharine Hepburn walk the leopard, Nissa, during a break from filming Bringing Up Baby (1938). 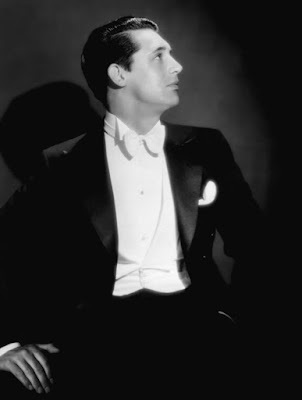 Three daytime picks: A birthday tribute to Cary Grant, who was born Archibald Alexander Leach on Jan. 18, 1904, in Horfield, England. Grant gained fame in 1930s in screwball comedies like the delightful Bringing Up Baby (1938) at 6:15 a.m., but in later years he took on more challenging roles such as playing a Cockney drifter in None But the Lonely Heart (1944) at 10:15 a.m. Grant and his third wife, Betsy Drake, play a couple who raises foster children in Room for One More (1952) at 6:15 p.m.
Prime time lineup: January's guest programmer is director Damien Chazelle who is receiving lots of critical acclaim for his new musical, La La Land (2016). His prime time choices are the MGM musical It's Always Fair Weather at 8 p.m., which he calls "the darkest of the MGM musicals. . .yet it's exuberant and alive" and The Umbrellas of Cherbourg at 10 p.m., which Chazelle believes "is the greatest movie ever made." Late Night Pick: Chazelle's late-night pick is Meet Me in St. Louis at midnight, which the director praises for being made "with such tenderness and love." Three daytime picks: The theme is movies starring suave English actor Herbert Marshall starting with his role as a diplomat who romances independent woman Katharine Hepburn in A Woman Rebels (1936) at 8:45 a.m. Norma Shearer is torn between her British lord husband (Marshall) and handsome Robert Montgomery in the pre-code soaper Riptide (1934) at noon. 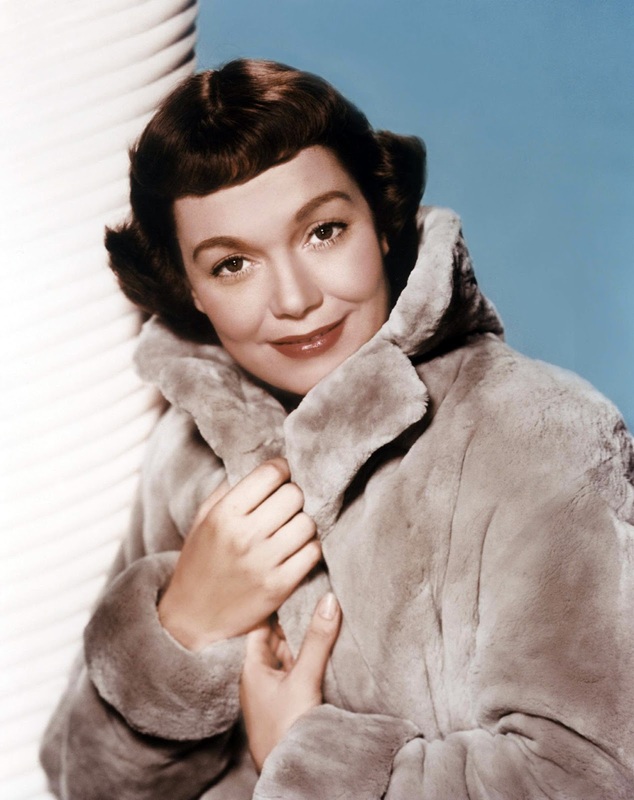 Marshall plays the author W. Somerset Maugham in the 1946 adaptation of his novel, The Razor's Edge at 5:30 p.m.
Primetime lineup: TCM is devoting every Thursday in January to star-of-the-month Jane Wyman. Tonight's lineup focuses on her lighter movies starting with the musical Here Comes the Groom (1951) at 8 p.m. which features Bing Crosby as a foreign correspondent who needs to marry a reluctant Wyman in order to adopt some war orphans. This movie is notable for the Oscar-winning song, "In the Cool, Cool, Cool, of the Evening." Wyman plays a civic booster who comes into conflict with political pollster James Stewart in Magic Town (1947) at 10 p.m.
Late Night Pick: Wyman plays the adopted daughter of luggage-store owning gangster Edward G. Robinson in Larceny, Inc. (1942) at midnight. Three daytime picks: The Wyman movies continue with Princess O'Rourke (1943) at 7 a.m. in which Wyman plays a woman who befriends royal-in-hiding Olivia de Havilland. 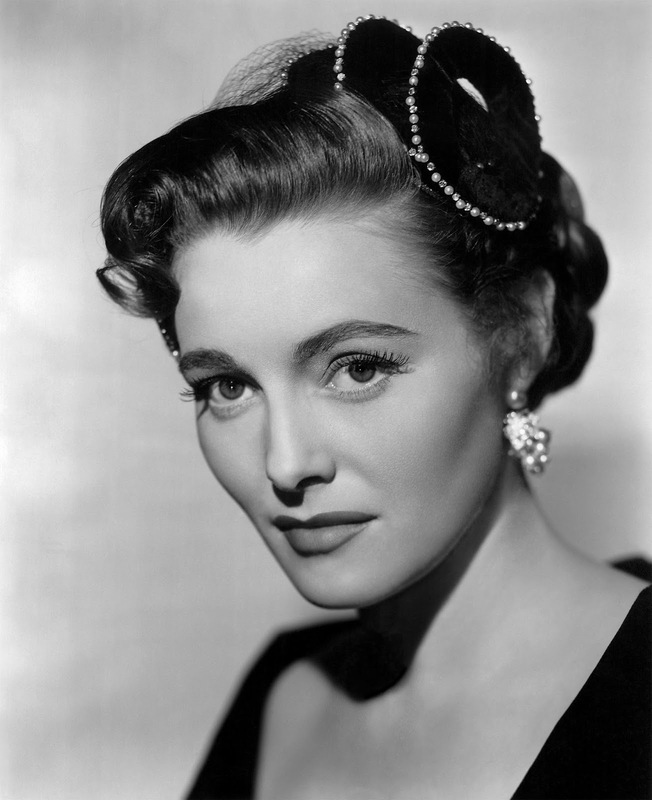 The afternoon lineup is a birthday tribute to actress Patricia Neal who was born Patsy Neal on Jan 20, 1926, in Packard, Ky. Neal's breakthrough came in the 1949 adaptation of Ayn Rand's novel, The Fountainhead at 1:45 p.m. followed by her performance as the manager of an Arkansas drifter (Andy Griffith) turned folk hero in A Face in the Crowd (1957) at 5:45 p.m.
Prime time lineup: TCM is airing six of the eight The Saint movies about mysterious crime fighter Simon Templar starting with the first movie starring Louis Hayward, The Saint in New York (1938) at 8 p.m. George Sanders took over the role for the next two movies, The Saint Strikes Back (1939) at 9:30 p.m. and The Saint in London (1939) at 10:45 p.m.
Late night pick: Hugh Sinclair took over the role in The Saint's Vacation (1941) at 2:45 a.m. The prime time lineup is all about actor Dana Andrews starting with his role as a principled prosecutor who tries to clear a vagrant (Arthur Kennedy) who is falsely accused of murdering a minister in Boomerang (1947) at 8 p.m. followed by Fallen Angel (1945) at 9:45 p.m., in which Andrews plays a drifter who marries heiress Alice Faye for her cash. Andrews also appeared in director Fritz Lang's last two American films, the noirs While the City Sleeps (1956) at 11:30 p.m. and Beyond a Reasonable Doubt (1956) at 1:15 a.m. The prime time line up features the first two of director Blake Edwards' Pink Panther movies starring Peter Sellers as bumbling Inspector Clouseau. The Pink Panther (1963) is on at 8 p.m. and A Shot in the Dark (1964) is on at 10 p.m.